Almost all important, pertinent data reflects continued weakness in the economy, especially retail sales and unemployment. There are small signs of inflation in spite of bogus government figures. In the flight to quality we see stronger gold, silver and commodities despite heavy market manipulation by the government. After more then two years of government and Fed intervention in the economy, only banks, Wall Street and insurance companies have been bailed out. The first part of the Stimulus package was unsuccessful, because the funds were not spent, they were used to eliminate debt. We do not think the next stimulus wave will be any more successful. 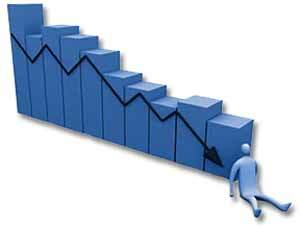 The economy should now move sideways for a year with slight GDP gains and a slowing in job losses. There will be no dramatic changes unless banks start lending in a bigger way or there is another $2 trillion stimulus package. Interest rates have moved slightly lower as the Fed’s intervention drives bonds up and yields lower. That will end early next year as demands for funds from both the private sector and government increases. Global capital has not expanded to meet those needs. Fed monetization of $500 billion is what foreign central banks are using to buy our Treasuries. Eventually the adverse effects of excess money and credit creation and budget deficits will take their toll. Commodity prices are already reflecting a flight to quality and gold and silver are attempting to make new highs. Wall Street and Washington tell us there is no inflation. If that were so why would gold and silver be acting in such a manner? The answer is flight to quality. There are no solid currencies left in the world to compete with gold, the only real money. This past week government repulsed breakout attempts by both gold and silver, but no matter what they do they will be eventually overwhelmed as more and more gold and silver will become the destination for hot money. The hedge against prolonged recession is in place and will be augmented soon by growing inflation. A double barreled dynamic. We currently have bubbles in both the stock market and Treasury market, both created by the Fed. Any reappearance of inflation will very negatively affect both markets. When these markets break, which they eventually must, you will again see horror among investors and many more bankruptcies. The increase of M3 by 14% for ten years has to be worked out of the system and it will be. Destabilizing is on its way. Just be patient. This depression in many respects is already worse than the 1930s and it will continue to deteriorate. There is no chance we will see sound money anytime soon. We are a minimum of ten years away from any kind of recovery and probably much more. The Treasury has a 10-year auction with bid to cover of 2.77% to 1, which is very good. The question is were the buyers acting for the Fed? Our president has asked the Senate to raise the short-term federal debt limit to $12.1 trillion. For fiscal year 2009 the Harvard endowment lost 27% and Yale lost 30%. For centuries and 50 years ago when we began this journey through life, the most important investment criterion was to preserve wealth, and it still is. Due to bouts of inflation the investment attitudes have changed somewhat. Some, even college endowments and pension funds have been playing the leverage game and not very successfully. The investment horizon is now measured monthly not over a span of years. As a result, results are not plus in double digits, but minus, as you can see from last year’s results. Even the mighty Swiss succumbed to using 70 times deposits. Even today after two years of market downside, the US and Europeans are still holding leverage of 45 times deposits, which is insanity. Due to the terrible damage done to the financial system for years wealth preservation is first and foremost in investment. The dollar is crashing, the market and bonds are overpriced, even commodities have peaked after a major rally, banks are failing and fear abounds. You say you’d like to sleep at night and not have to worry about your wealth; well there is a way to accomplish that. Buy gold and silver related assets. After ten years gold has finally broken out over $1,000 an ounce, a signal that phase 2 of 3 or 4 phases has begun. Gold could reach anywhere from $1,200 to $1,700 an ounce before the year is over. If you buy gold and silver coins or bullion, take delivery and store them in your safe at home. At this stage of the gold and silver bull market anchor your portfolio with 3 or 4 of the strongest producing mining companies and exploration shares. In the 1977 to 1981 period some of the leveraged speculative shares went from $0.35 to $55.00 and that could well happen again. In today’s markets this is how you preserve your wealth. Get out of the stock and bond markets except for gold and silver shares. Terminate cash value life insurance policies and annuities; they invest in the stock market. Although mutual life companies have to invest in bonds. If you have to have some of your assets in cash, own treasuries from Canada, Switzerland or Norway. We are embarking on one of the most unusual times in investing history. Only 10 to 15 percent of investors will participate, the rest will lose 60 to 90 percent of their assets, their wealth. Don’t you be one of those losers. Don’t forget the elitists cannot print gold and gold is debt free. For 6,000 years it has been the only real currency. Gold and silver’s fundamentals are overwhelming. The supply is limited and production is falling and will continue to fall for years to come. Governmental and central bank debt is increasing exponentially and that is destroying the value of all currencies versus gold. Major nations are now aggressive major gold buyers. Gold and silver are going higher. Do not miss the opportunity to protect your wealth and perhaps to become very wealthy. Our estimate of real unemployment, U6 minus the Birth/Death ratio, is 21% or 30 million people unemployed or employed part-time. If you include dependents that affects some 100 of 300 million Americans. In part as a result, yoy there has been 126,000 bankruptcies up 34%. That 9.7% unemployment just doesn’t tell the entire story. We continue to see energy and commodity inflation, which translates into higher prices, which are aggravated by lower wages. About a year from now, in the absence of further stimulus or increased bank lending, unemployment will rise to over 30%. That will lead to major economic, financial and social problems the likes of which no modern economy has ever seen. Residential and commercial real estate have 20 to 30 percent downside left depending on the market region and 25%, soon to be 50%, of US mortgages are currently underwater and 50% of mortgages will be in negative equity within a year. That is when Americans will finally realize their country is bankrupt. The FDIC and mortgage lenders are broke along with 50% of the population. Over the next three years between 3,200 and 4,200 banks will go under and the Fed will create $23 to $60 trillion to bail out the mess. Either that or your savings deposits will go up in smoke. We have $1.3 quadrillion in derivatives to be settled. If only 5% fail the financial system collapses. Banks are still leveraged 5 times deposits and carrying massive losses on their books. Despite the government gobblygook initial jobless claims have worsened. Foreclosure filings in August stayed near July’s record highs. Filings fell 1% mom and were up 18% yoy. One in every 357 US households with homes got a foreclosure filing in august. Commercial paper expanded for a 4th straight week for the first time since December. CP rose $11.3 billion to $1.174 trillion outstanding. ABS CP out rose $6.2 billion after rising by $19.5 billion the prior week. Unsecured financial issuance rose by $6.2 billion after falling $11.3 billion the previous week. The government sold $12 billion worth of 30-year bonds. The bid-to-cover was 2.82 to 1, above the average of 2.38 over the last four reopenings. Foreigners bought 46.4% of the sale, above the average of 40.9%. Many the times we went to the Tavern on the Green, a very high-class restaurant in NYC. On Thursday they filed bankruptcy. If Bernanke increases the Fed’s debt monetization scheme of $300B that is scheduled to end in October, the Chinese and Mr. Market will be very unhappy. The dollar will tank further; gold, oil and commodities should surge. This action should actually force bonds lower. If Bernanke refrains from further debt monetization, US dealers will be holding the bag and the short-term outlook for bonds would be negative. Bernanke will soon be forced to choose between saving the dollar and bonds or stocks. An Associated Press-GfK poll says that public disapproval of President Barack Obama’s handling of health care has jumped to 52 percent. The same survey shows that 49 percent now disapprove of his overall performance as president. In July, just 42 percent disapproved of how he was handling his job. The number of people crossing the northern and southern land borders into the USA has dropped sharply since a passport requirement began June 1. Businesses in tourism-dependent border communities blame the policy for making a bad year worse. At Martin’s Fantasy Island, an amusement park in Grand Island, N.Y., about 10 minutes from the Canadian border, “our Canadian business is way off,” spokesman Mike McGuire says. Nearly one-third fewer Canadian families of four have come for discounted “Canadian Wednesdays” compared with last year, he says. He blames the recession, a soggy summer and the passport rule. Household incomes decreased in 2008, the first full year of the recession, and the poverty rate rose to the highest since 1997, government data showed. The median household income fell 3.6 percent to $50,303, snapping three years of increases, the Census Bureau said today in its annual report on incomes, poverty and health insurance. The poverty rate climbed to 13.2 percent from 12.5 percent. The number of people living in poverty rose to 39.8 million last year, an increase of 2.6 million from 2007. The U.S. trade deficit widened in July and imports gained by a record 4.7 percent, signaling a revival of commerce as the global recession eased. The gap between imports and exports grew 16 percent, the most in more than a decade, to $32 billion from a revised $27.5 billion in June that was larger than previously estimated, the Commerce Department said today in Washington. In another sign the U.S. slump may be ending, a Labor Department report showed jobless claims last week fell to the lowest level since July. Imports outpaced a 2.2 percent gain in exports as businesses replenished stockpiles of goods including pharmaceuticals, toys and televisions in anticipation of rising consumer demand, while automakers boosted purchases of parts and machinery. The export gain reflected renewed demand for U.S.-made goods among trade partners such as Mexico and Japan. “Credibly” privatizing Fannie Mae and Freddie Mac, the mortgage-finance companies seized by U.S. regulators last year, may be too difficult given the precedent set by the Treasury Department’s financial assistance, according to a Government Accountability Office analysis. The Treasury today reiterated that the government intends to make recommendations on Fannie Mae and Freddie Mac next year. The companies, which own or guarantee about $5.4 trillion of U.S. residential debt and have accounted for about 70 percent of all new home loans this year, would need a “potentially lengthy transition” given their size, the GAO said. The number of Americans filing first-time claims for jobless benefits dropped last week to the lowest level since July, a sign the labor market is deteriorating at a slower pace. Applications fell by 26,000 to 550,000 in the week ended Sept. 5, lower than economists forecast, from a revised 576,000 the week before, Labor Department data showed today in Washington. The total number of people collecting unemployment insurance declined to the lowest level since April. Electricity demand is forecast to fall 3.3% this year as a slump in industrial consumption continues to weigh on sales, the government said Wednesday. In its monthly Short-Term Energy Outlook, the Energy Information Administration said it expects demand to improve in the second-half of the year as residential consumption begins to recover. After seeing a 4.4% decline in the first half of the year, the EIA expects demand to be down only 2.3% during the second half of 2009. As for 2010, the agency sees demand growing 1.2%. The EIA last month had projected a 2.7% drop in demand for 2009 and a 0.8% increase in 2010. The agency continues to see residential power prices rising this year, but again curbed its estimates. The EIA now is forecasting a 2.5% increase this year driven by rate increases in the first half of the year. The agency significantly cut its outlook for power prices for next year, now seeing a decline of 2.1% amid a sharp drop in natural gas prices. Last month, the EIA estimated a price increase of around 4.2% this year and 2.6% in 2010. National chain-store sales rose 0.2% in the first week of September versus the previous month, according to Redbook Research’s latest indicator of national retail sales released Tuesday. The rise in the index compared with a targeted 0.3% drop and came as sales picked up heading into Labor Day. The Johnson Redbook Index also showed seasonally adjusted sales in the period were down 2.4% from September 2008 and compared with a targeted 2.9% fall. The latest numbers are starkly different because they don’t include Wal-Mart Stores Inc. (WMT), which earlier this year stopped giving monthly same-store-sales figures. The International Council of Shopping Centers and Goldman Sachs Retail Chain Store Sales Index rose 0.6% in the week ended Saturday from its level a week before on a seasonally adjusted, comparable-store basis. On a year-on-year basis, retailers saw sales decrease 0.1% in the latest week, with the decline moderating from recent weeks. Application volume was up an unadjusted 64.5% for the week ended Sept. 4 compared with the same week in 2008, according to the Washington-based MBA’s latest weekly survey. The survey covers about half of all U.S. retail residential mortgage applications. Week-to-week filings fell a seasonally adjusted 2.2% in the week ended August 28. Refinancing applications were up 22.5% last week from the prior week before — the biggest jump since mid-March. And applications for mortgages to buy homes were up a seasonally adjusted 9.5% — the largest such gain since early April. The four-week moving average for all mortgages was up 7% on a seasonally adjusted basis, the MBA said. Refinancings made up 59.8% of all applications last week, up from 56.5% the previous week, while adjustable-rate mortgages accounted for 5.8%, up from 5.6%. The average rate on 30-year fixed-rate mortgages was 5.02% last week, down from 5.15% the week before. Fifteen-year fixed-rate mortgages averaged 4.45%, down from 4.57% the previous week, with one-year ARMs averaging 6.69%, down from 6.71%. To obtain the rates, the 30-year fixed-rate mortgage required an average 1.23 points, the 15-year fixed-rate mortgage required an average 1.13 points and the 1-year ARM required an average 0.19 point. A point is 1% of the total mortgage amount, charged as prepaid interest. Nevada has replaced Tennessee as the state with the most bankruptcies, as filings continue to stack up nationally. From January to August, national bankruptcy filings reached 954,911, up from 703,732 in the same period of 2008, according to Automated Access to Court Electronic Records. In August, filings were up 22% compared with August 2008. It is likely that filings will total 1.45 million this year, says Robert Lawless, professor of law at the University of Illinois. The default rate on commercial mortgages held by U.S. banks will rise to 5.4 percent in 2011, the highest since at least 1992, as banks anticipate more losses amid falling rents, according to Real Estate Econometrics LLC. The property research firm increased its projected default rates for 2009 to 2011 amid declining occupancies and incomes at hotels, shopping malls and office buildings. Defaults will rise to 4.2 percent this year and 5.3 percent next year before peaking at 5.4 percent in 2011, the New York- based firm said. Previously, it estimated rates of 4.1 percent this year, 5.2 percent next year and 5.3 percent in 2011. “The higher default rate reflects a larger number of loans moving from delinquency to non-accrual status,” said Sam Chandan, president and chief economist of Real Estate Econometrics, in a statement. Loans moved to non-accrual status signify the bank doesn’t expect to be paid back in full. The default rate more than doubled in the second quarter. Loans that were 90 days or more past due climbed to 2.88 percent of outstanding balances from 1.18 percent a year earlier, according to the firm. Commercial mortgages labeled as “non-accrual” more than doubled last quarter to $27.76 billion, according to Real Estate Econometrics. Balances for delinquent loans, those that were 30 to 89 days past due, fell. “This shift corresponds with banks working to identify and mitigate losses associated with problem loans earlier in the delinquency period and an increase in the share of delinquent loans that will require modification or foreclosure,” Chandan said. The Congressional Oversight Panel did not provide an estimate of the projected loss in its latest monthly report on the $700 billion Troubled Asset Relief Program. But it said most of the $23 billion initially provided to General Motors . and Chrysler late last year is unlikely to be repaid. The prospect of recovering the government’s assistance to GM and Chrysler is heavily dependent on shares of the two companies rising to unprecedented levels, the report said. The government owns 10% of Chrysler and 61% of GM. The two companies are currently private but are expected to issue stock, in GM’s case by next year. The number of open jobs fell 50% over the past two years to a seasonally adjusted 2.4 million in July, the lowest in the brief history of the data, the Labor Department reported Wednesday. The job opening rate fell to a record-low 1.8% in July. Job openings track the demand for labor, the flip side of the unemployment rate, which measures the supply of labor. In July, there were 6.05 unemployed people for every job opening, according to the most recent data on labor turnover. In December 2007, when the recession began, there were 1.72 unemployed people for every job opening. The number of workers hired in July was little changed at 4.06 million, while the number of workers separated from their jobs was little changed at 4.29 million. The hires rate rose to 3.1%, while the separations rate remained at a series-low 3.3%. In the past 12 months, hires have fallen 13.9%, while separations are down 12.8%. Layoffs were little changed in July at 2.3 million, while 1.7 million people quit their job. Layoffs have increased 15% in the past year, while quits are down 32%. In the 12 months ending in July, hires totaled 51.3 million and separations totaled 56.6 million, with a net job loss of 5.3 million. The federal deficit surged higher into record territory in August, hitting $1.38 trillion with one month left in the budget year. The Treasury Department says the deficit last month was $111.4 billion, below the $152 billion that economists expected. Still, the imbalance added to a flood of red ink already accumulated through a severe recession and massive spending needed to stabilize the banking system. The Obama administration last month trimmed its forecast for this year’s deficit to $1.58 trillion, from an earlier $1.84 trillion. The recovery of the banking system led to the reduced estimate as it meant the administration did not need to get an additional $250 billion in bailout support for banks. company said in a statement. One in 357 households received a filing. Consumer sentiment improved as of the middle of September. The Reuters/University of Michigan preliminary consumer sentiment index for September stood at 70.2, from 65.7 in August. It had been expected to stand at 67.5. The preliminary current conditions index was 71.8, from 66.6, while the expectations index was 69.2, up from 65.0 in August. The one year inflation expectations index came in at 2.8%, after August’s 2.8%, while the five year inflation expectations index hit 2.8%, versus 2.8% the prior month. US Aug Import Price Index rises 2.0% MoM and moderates its decline to 15.0% yearly. Higher crude-oil prices drove import prices up by 2% in August, the fifth increase in the past six months, the Labor Department reported Friday. Import prices have risen 7.6% so far in 2009 as energy prices have rebounded. Despite the recent gains, import prices are still down 15% over the past 12 months. Imported fuel prices rose 9.8% in August, but they’re down 39.6% in the past 12 months. Prices of nonfuel imports into the United States rose 0.4% in August, the largest gain in a year. Nonfuel import prices are down 5.1% in the past year, showing that general deflationary pressures haven’t been confined to energy goods. The Commerce Department said total wholesale inventories dropped 1.4 percent to $387.2 billion, the lowest level since September 2006, after a revised 2.1 percent decline in June, previously reported as a 1.7 percent slump. Economists polled by Reuters had expected a 1 percent drop in July from June. Compared to the same period a year ago, inventories fell 12.8 percent. Companies have been slashing accumulated stockpiles of goods as the economy reels from the worst recession in seven decades. Furniture inventories fell 2.7 percent, while stocks of unsold metal declined 4.4 percent in July. Wholesale sales rose 0.5 percent in July, the biggest advance since June 2008, after rising by a revised 0.3 percent the previous month. June sales were previously reported as 0.4 percent higher. Commercial-property sales in the U.S. this year are forecast to fall to the lowest in almost two decades as the industry endures its worst slump since the savings and loan crisis of the early 1990s. About $16 billion of office transactions will be completed by year-end, according to data compiled by Real Capital Analytics Inc., a New York research firm that has tracked deals for almost a decade. Real Capital Managing Director Dan Fasulo and Sam Chandan, chief economist of Real Estate Econometrics LLC, said that may be the lowest volume since at least 1991. There’s no real way to sugarcoat it, Fasulo said in an interview. A slowdown of this magnitude certainly hasn’t occurred since I’ve been in the business. The budget deficit for August was only $111.40 billion and that is 11 straight months of deficits.